While searching for the best portable solar charger for your money, we came across the anker 21w solar charger. It holds a 4.3 rating on Amazon, as well as the badge for Amazon's Choice. So it is a pretty good product. Let's get into the nitty gritty of the Anker 21W Solar Charger. The Anker 21W solar charger prides itself with being able to charge your devices quickly while being super portable. The charger itself weighs 14.7 ounces and can fold to a fairly small size of 11.1 x 6.3 inches. From there it can unfold to easily cover a backpack. Unfolded it sizes 26.4 x 11.1 inches. In terms of power, it uses Anker's exclusive technology called PowerIQ, which discovers and replicates your device's original charging protocol to provide its fastest possible charging speed. It can handle amps from 2.4 to 3 overall, as long as there is enough sunlight. This device is purely a charger, it is not a power back. Meaning that the power generated by the solar panels does not hit a battery and then your device. It just goes straight to your device. This can be a good thing because often times the power that a power bank gives out is much less efficient at charging your device than a direct current. However, this can also be a bad thing because there is no option to charge it before you set out and charge something later. You will need to buy an additional power bank. In addition, it features two USB ports, which is awesome if you want to charge multiple things at once. You can charge a power bank at the same time as your phone without the solar charger having to split the output power. As for the panels themselves, they are made of an industrial strength PET polymer, making them fall under the monocrystalline solar panel category. This means that the panels are highly effective, but also the build of PET makes them resistant to humidity, scratches, UV rays, and give a high clarity. Since there is no battery or other major circuits to protect, the only thing at risk of getting damaged is the solar panels. However, the outer casing is made up of a rugged polyester, which can take a decent amount of punishment. The dual USB charging ports are also covered by the polyester, so they have a fairly low risk of getting damaged and it does a great job of keeping water away from them, as well. There are also two stainless steel eye-hole rings at the top of the charger, between the first panel and the charging ports. This addition makes it easy to secure to a backpack if you are hiking and you need to charge something. The polyester that covers the charging ports also forms a pocket that you can safely store your device while it is charging. Leaving smartphones lay out in the sun is not great for them, for any electronics actually. There are no buttons, lights, or anything. The only light is on the USB ports, which light up red when they are being charged by light. Simply place in the sun, plug in and you are good to go. It is a very simplistic solar charger, which makes things very convenient. The Anker 21w solar charger actually have quite a few certifications like FCC, CE, and RoHS certifications. These show that the charging you will get from this solar charger is top tier and completely safe. Anker is a technology company based out of Seattle, Washington and Shenzhen, China. The company was founded by Steven Yang in 2011 after he left his former job as the senior software engineer for Google. They were first focused on developing replacement laptop batteries, however in 2012, their focuses shifted towards smartphones. Anker also developed their own exclusive charging technology called PowerIQ, which detects the connected device and automatically optimizes the current delivered. This allows for the highest possible power flow from charger to device, while other chargers only give a predetermined power output. In fact, many of their charging devices use various fast-charging technologies, like Quick Charge. They have also been mentioned in 2015 as the leading brand of mobile chargers on Amazon.com. The company is officially known as Anker Innovations. They also have 5 brands under their belt. Anker, Eufy, Zolo, Roav, and Nebula. Each of these brands specializes in a specific area of technology. The Anker 21w Solar Charger does not include a power bank. This means that you get a pure charge without the power passing first through a battery, giving you a much more efficient charge. The device is fairly lightweight and can fold down into a highly portable size. In it's folded state, it can easily be stored in a backpack pocket, or even carried. IT becomes roughly the size of a folder. The solar charger features Anker's exclusive PowerIQ, which give a very fast and reliable charge. It also supports other fast charging features like Quick Charge and Lighting Charge. The polyester casing protects the panels themselves, along with the dual USB charging ports. The pocket that covers the ports also makes it easy to store small devices while charging. It gives a very efficient charge to your devices as each port is capable of outputting 2.4 amps and maxes out at a charging speed of 3 amps. Stainless steel eye-ring holes make for easy and secure fastening to backpacks when hiking or otherwise. While it is in the sunlight, the reliability is great. Dual USB charging ports make it easy to charge two devices at the same time (say a smartphone and a power bank). Plus the power output will be equal to each port. It can be a little big, making portability a bit of a hassle. When folded, it is the size of a folder which can be too big for some people. It is basically useless when there is no accessible sunlight, as there is no power bank included. You will have to buy an additional power bank and charge that using the solar charger before you go out. If you are looking for sheer power and durability, the Anker 21w Solar Charger is the one for you. While it lacks a power bank, it makes up for it in fast, reliable charging speeds, as the current does not pass through a battery first. It can be a bit big but it is durable and still portable. The dual USB ports make it very convenient in charging multiple devices at once, without sacrificing power to either one. We have come to the conclusion that the pros far outweigh the cons. 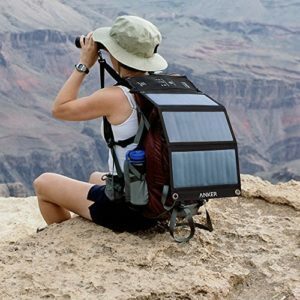 However, if size is a big issue for you, this may not be the best portable solar panel for you. That being said, you will definitely get your moneys worth from this solar charger. Anker makes quality products and the Anker 21w Solar Charger is no different. Right now, you can find it on Amazon.com for about $61.99 and you can also pair it with an Anker power bank that might run you $41.99. For more information, be sure to check out the rest that Green and Growing has to offer. Here are some top questions that I found for people seriously considering buying an Anker 21w Solar Charger. What type of solar cell does this use? The solar charger features an industrial strength PET polymer, which falls under the Monocrystalline solar panel category. A very efficient and durable solar panel. What kind of devices can this charge? This solar charger can handle pretty much any smartphone, cellphone, or tablet. It can support any 5v USB compatible device. Does it come with any warranty? It comes with Anker's 18-month warranty and customer service.